All transformers must be tested for winding insulation resistance and the readings confirmed as acceptable. 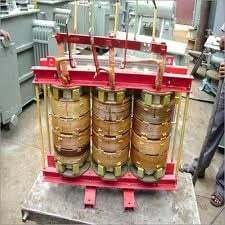 However HV D.C. tests on a cable connected transformer cannot be done because the windings of the transformer short out the d.c test set. 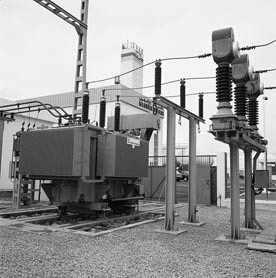 If between-core tests are required on transformer feeder cables after installation then a link box must be provided to disconnect the cable from the transformer windings. If transformer covers are taken off to achieve internal disconnection the tools used must be clean and secured externally by white tape so that they may be recovered if inadvertently dropped. All nuts and washers must be accounted for and all operatives should be asked to empty their pockets while working over the open tank. Waterproof covers should be provided during the period when the transformer tank is open. If it is not possible to disconnect the cables after jointing they must be tested beforehand. This means that the jointing and testing programme must be carefully planned to avoid leaving cable ends unsealed for long periods. 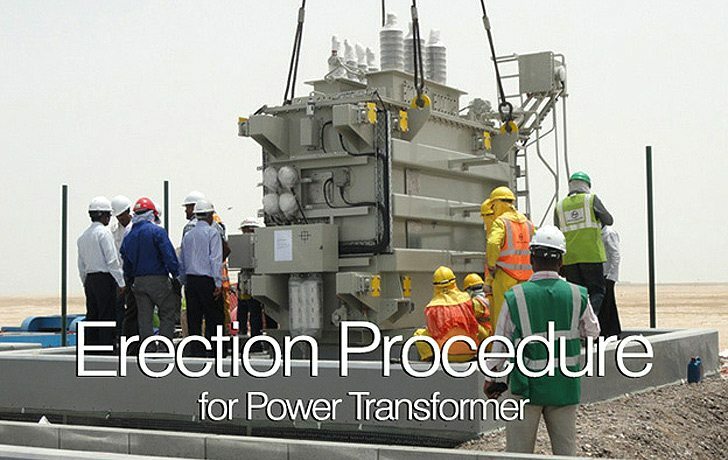 Transformer diagrams should be inspected and the phasing diagram confirmed as correct. Also before energising, the voltage selector must be set on the appropriate tapping having regard to the voltage level of the system. Transformers which are to operate in parallel must be set on the same tapping and they should be checked as having the same impedance. Voltage selectors should be locked in their set position and if they are of the ‘off-circuit’ type they must not be adjusted without the supply being first switched off. Earthing arrangements for the tank and the neutral or other system earthing must be confirmed and completed before testing and commissioning. Where special tests for losses, ratio, phase angle or winding resistances are specified the assistance of the manufacturer should be sought. Ensure that the oil level is adequate and that breather tubes are clear. Commission silica gel units by removing the airtight seals from the cannisters and filling the oil sealing-well to the correct level with transformer oil. The colour of the silica gel must be checked and the filling changed if it shows dampness (red for wet, blue for dry). As dry-type transformers are more susceptible to external damage they must be carefully handled and stored on site. They must also be kept in a dry, warm atmosphere until they are put in service, to prevent ingress of moisture. Satisfactory insulation tests are imperative before commissioning. Because they are wholly dependent on surface radiation and air convection for cooling, they must be checked for any accumulation of dust or dirt which can block the air ducts and reduce the flow of air. Cleanliness is essential, particularly where the connection leads leave the windings and at the terminal supports. Damp dust leads to tracking and causes expensive damage. It is particularly important to check such transformers for dust in package substations which may escape the notice of commissioning staff. The article provided is good. For a common distribution transformer what is the value for earth resistance and capacitive calculations?? if the line voltage is minimum can we use a industrial grade capacitor to boost the voltage? Could you please suggest me post energizing test of dry type transformer 20KVA?? I shall be grateful to you for you quick response. Sir I follows ur concept regularly….I want to produce power using only heat ,would you please tell me is it possible? Hi Edvard! please i want know to control “B” STROKE. i will appreciate your warm guide lines. I am a regular reader of your articles, helped me in my profession. I would like to know some thing about the timing tests of circuit breakers. Is there any reference for the timing test, to make the comparison between the measured with some internationally acceptable data. Coz recently i faced this question, from my colleges. The question was how much will be the timing test value for a circuit breaker – 11 Kv,22,kv,33 Kv, 132 kv, 220 Kv. My belief was that its with the designer. And each manufacturer has their own values depend on the product they produce. Can you please guide me through this …. hello i am new to this site. and i have read many articles on transformer and motors. but i cant find the different tests carried out on transformer after erection and on load. and also the control circuits of induction motors and transformers. i am regular reader for your technical article & these article very useful for me in my working style.